In three places, Yellowstone’s roads go above 8,000 feet (2,440 m): Sylvan, Dunraven, and Craig Passes. These are the latest roads to open in the spring and the hardest to keep clear of falling rocks and huge potholes, but they are special places to summer visitors. You’ll see mounds of snow persisting into June and early July, numerous waterfalls tumbling out of the mountains, and a million wildflowers. You can see beautiful wildflowers from the Mt. Washburn Trail near Dunraven Pass. 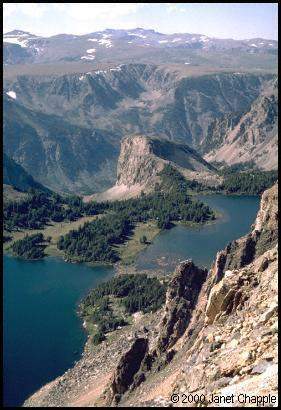 Bighorn sheep live here, and bears feast on whitebark pine nuts at the end of summer. 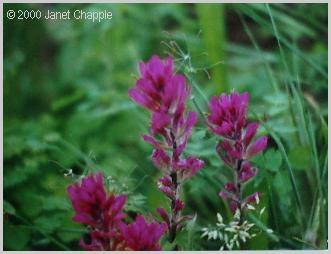 An unusual pink variety of Indian paintbrush (left) is one of the kinds of flowers you can see north of Dunraven Pass, the highest road in the park at 8,873 feet (2,704 m). Just outside the Northeast Entrance is the Beartooth Highway, the road Charles Kuralt once called “the most beautiful road in America.” As the road crosses the mountains at almost 11,000 feet (3,350 m), the near views are studded with lovely lakes (including Twin Lakes, at right) and the far views take in much of the high Beartooth Plateau to the west and the Absaroka Range to the south. 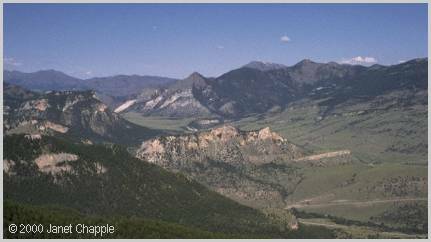 Almost as spectacular and also leading to the Northeast Entrance is the Chief Joseph Scenic Byway. Although 3,000 feet lower than the Beartooth Highway at the summit, the views here (below) are also outstanding. CREDITS: All photos on this page are by Bruno Giletti. IN THE GUIDEBOOK: On this page are views of one mountain pass within the park and two just outside it. Are there other passes over 7,000 feet high (2,100 m) on the approach roads? See pages 114 (map) and 125 of the fifth edition. Revised August 3, 2017. All Rights Reserved.